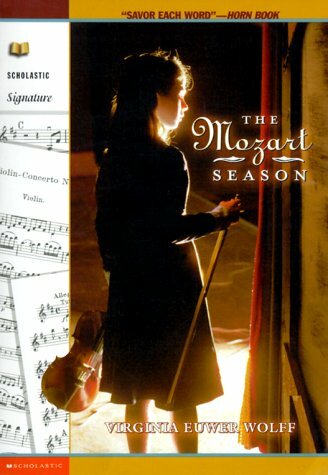 Allegra is a violinist entering a prestigious Mozart music competition. At 12 years of age, she is the youngest finalist in the competition, and works closely with her violin teacher to be prepared. But as she memorizes the Mozart concerto, other things in her life begin to affect her music. Her mother’s emotionally wounded friend, Deirdre, who is a genius vocalist, makes Allegra wonder about how pain can find a voice through music. Allegra’s grandmother, who escaped the Nazi death camps, urges Allegra to embrace her Jewish heritage, and Allegra reflects on her identity as a musician. And there is a mysterious homeless man who haunts all the local concerts in the park, dancing by himself in the back and searching for a song he can’t remember. As a musician, I enjoyed this story so much. The writing is quite accurate about how one feels about learning music, and embracing it, and connecting with the composers; how you can make yourself crazy practicing too much, how your nerves will go haywire before or after a performance, how music shapes everything you do and everything you are. I was immediately drawn into the story, because the first scene is a music lesson with Allegra’s teacher, and I was reminded of myself as a music teacher, urging my students to practice, trying to inspire them to believe in themselves and feel the music as a part of themselves. I saw myself in the story, both as Allegra, remembering when I was a young piano student, and as Allegra’s teacher, as I am now, passing on my love of music to my students. The very best part of this book was Allegra’s relationship with her music teacher and her parents. They are such lovely authority figures in her life, ready to guide and listen and comfort, but also giving her the space to figure things out for herself and stretch her wings. I really loved finding a kindred voice in this little girl musician, wrestling with her family identity, wrestling with Mozart, wrestling with ideas in her head. She is always looking for connections between the elements of her life, and she revolves those thoughts around in her mind over and over again until she sees their meaning. She’s incredibly sensitive, as all good musicians are, and everything she sees and hears makes a deep impact on her. My one suggestion would be to include a glossary for the musical terms that non-musicians wouldn’t know. Or read along with a dictionary close by. As I was reading, I would stop and look up recordings of the various classical songs that are mentioned. And I listened to Allegra’s main song for competition, Mozart Concert No. 4 in D, over and over as I read. (The recording I listened to was with Hilary Hahn as the violinist.) It really enhanced the story to be able to hear the nuances of the pieces. “Talking about music is like dancing about architecture.” And yet this book does a wonderful job of describing music, how musicians feel, and how audiences respond at performances. Beautiful from beginning to end!